Today is the day to pack up summer clothes, the skirts and tank tops, capris and shorts, and those dozens and dozens of golf shirts. It is time to pull boots from their place ‘neath the bed, the ones I have missed and the ones I’d forgotten, and replace them with sandals, all except for that one pair of flip flops because, well, you just never know. Time for flannel pajamas and warm fuzzy sweaters, long sleeves, wool socks and turtlenecks. It is time for winter coats, hats and mittens, sorting and searching for all the lost mates, time for scarves to be washed and hung on their pegs, time for that spring green raincoat to hide itself back in the closet. It is time for the fans to be stored in the basement, time for storm windows to be closed, all except for the window right next to my bed, because hot flashes happen, even in winter. 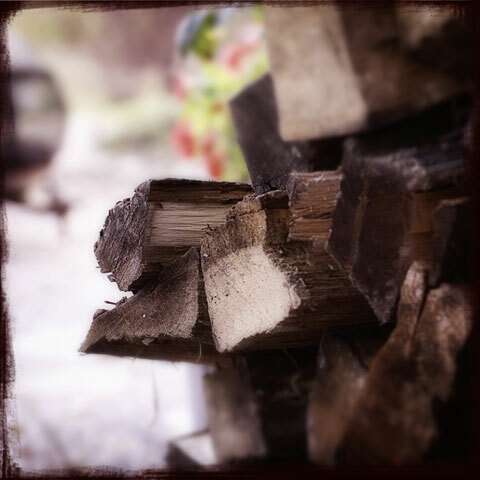 It is time to split wood and stack it all neatly, four face cords across the driveway, a place for mice to hide and kittens to play, a place we will visit all winter. Time for the wood ring to be set just outside the back door, easy access when snow drifts take over the landscape. It is time to empty flower pots long past their prime, time for garden furniture to be stacked and put into storage, time for cutting back perennials, the clearing of leaves, and for pulling those last tenacious weeds. It is time for cozy nights in front of the fire, crisp frosty mornings and dark shorter days, oatmeal for breakfast and tea after lunch. and waiting, waiting for winter. This entry was posted on Saturday, October 16th, 2010 at 2:29 pmand is filed under . You can follow any responses to this entry through the RSS 2.0 feed. You can leave a response, or trackback from your own site. Yes, it is time. It’s freezing! I think I need to go buy another blanket for my bed. Actually, I am sure I do. It is indeed time for the red blanket thrown on the bed, hot chocolate in the evening instead of elderflower cordial, woolly hat on my head as I trudge off to work, thermal socks and cashmere against my skin. Whew….my heart skipped a beat when I read the title on my blogroll….I thought you were packing in your blog! I’ll be switching out seasons as well, but probably in November. But isn’t it also a great time! Coziness, warm tea, fuzzy socks, crackling fireplace, movies with the hubby…I really love this time of year! *sigh* I can only imagine…Even in our “winter” it is never like that. Here in NorCal we don’t have real winters as I know them from back in Germany (except in the Sierra, of course). I do miss a real good winter with tons of snow, freezing cold and clear blue skies. I do NOT miss the short grey days that never seemed to stop… I get my “winter fix” every January for my birthday when we go to Yosemite for the long MLK weekend. Funnily enough I started packing some of my summer clothes away just yesterday . . . I had to laugh because like you I’ve kept one random pair of flip flops out just in case! Great minds think alike. How beautiful – I always leave summer kicking and screaming. Yes, I’ll grasp on to the loveliness of the things you paint here, but come January, longing for summer will begin again. Maybe winter is good because it makes us appreciate summer more?